We are truly a one stop shop for all your skin care and beauty treatments. As well as clay facials, we have a range of other facial treatments and therapies we can offer you. We can tailor a facial to your needs. We don’t all wear the same size shoes and that is the same for facials. One size does not fit all. Come and see us, we are in Lane Cove (access via Birdwood Lane) on the second floor, North Shore Sydney. If you are coming by car don’t worry, parking should not be a problem. We are surrounded by (in most cases 3 hours free) free Lane Cove council car parks. Make your booking today. Before we start your clay mask facial we will discuss what products would be best suited to you skin type. Depending on what skin problem you may have. Such as wrinkles, oily skin, acne skin, blackheads, tired or dull skin. Once we agree we will start the clay mask facial treatment. This skin exfoliant product is a special formula to balance oily skin. Remove impurities to leave your skin looking revitalised and fresh. This skin exfoliant contains natural extracts of papaya and aloe vera. That will balance and protect the skin’s natural moisture. This skin exfoliant cleansing gel has a mild scent with 100% pure essential oils of grapefruit and lime. Enriched Certified Organic Lavender Essential Oil - Pure relaxation! Lavender oil is well known for its soothing effect on body and mind. This skin softening luxurious scrub treatment is a special formula moisturising cream and skin smoothing agent. The exfoliating scrub sugar and a special moisturising cream blend. The jojoba and avocado oils will leave your skin smooth as silk. It is enriched with papaya, ginkgo biloba and pineapple fruit extracts. Which are a great natural source of vitamins A, C and E.
If we have a more suitable product for your skin type we will use that. 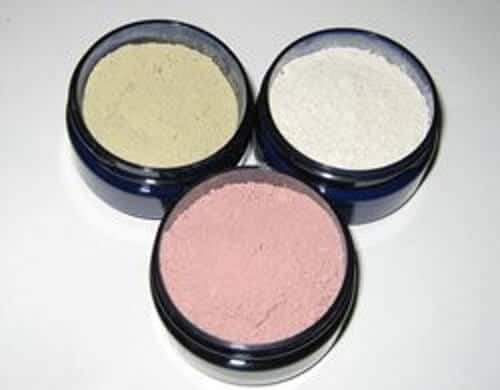 We have four world class clay facial masks to choose from. Plus an optional Ylang Ylang and Orange, Dead Sea Mineral Mud Face & Body. With a name like that it must be good. If you click on each clay below you can see a full description of each treatment. There are no reports of allergy to clay in scientific literature. However, preliminary patch test is advised before general application clay facial masks. With one of our great natural moisterising creams. Enhanced 100% Pure Essential Oils and Botanical Extracts - Green tea is known as an anti-antioxidant. It has high levels of vitamin E and C. These properties strengthen skin’s elasticity. Gives it a more youthful glow. The soothing moisturising cream is rich in 100% pure orange essential oil. Botanical extracts of chamomile and ginseng which moisturise and hydrate your skin without leaving it feeling greasy. Day and Night Nourishing Cream. Enhanced, Certified Organic Botanicals and Citrus Oils. The key nourishing cream ingredient in this formula is calendula. It is highly effective in preventing skin from over-drying. This nourishing cream, enhanced with extracts of chamomile, aloe vera & honey powder. It will soothe and nourish damaged skin without leaving a greasy feeling. It has a light scent of 100% pure essential oils of lemon, tangerine and bergamot. To give it a fresh, clean nourishing cream scent that will last for hours. Now you know about the fantastic clay facials, make you booking today. Come in to Xara Skin Clinic ™ in Lane Cove on the North Shore. Talk to us today about starting your best clay facial body mask treatments on the North Shore of Sydney treatment today. For an all over whole body experience come and see us in Lane Cove on the North Shore. Come and relax in our opulent ambiance, welcoming staff, the scent of essential oils, calming music, the soft cool breeze. For world class, exclusive treatments and products, we are the beauty and skin care experts in Lane Cove on the North Shore.